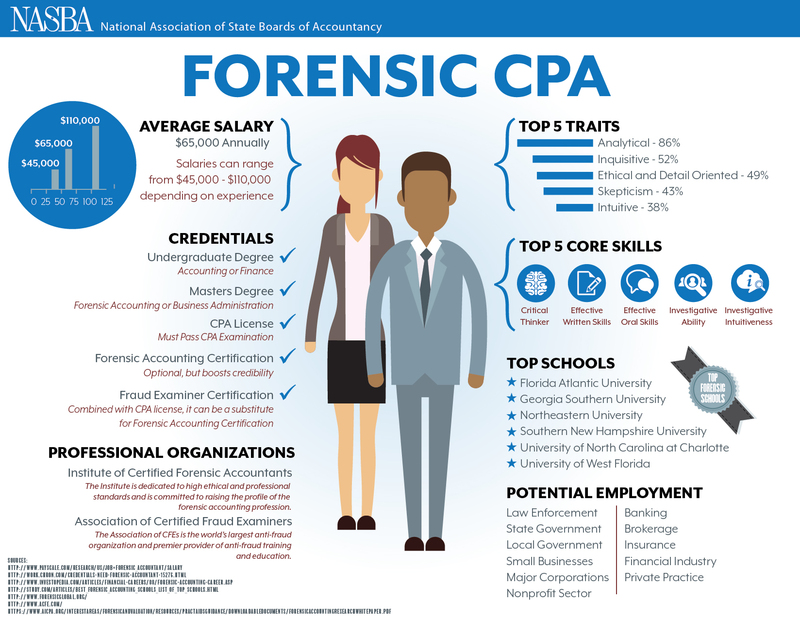 What Does it Take to be a Forensic CPA? Imagine infiltrating the criminal world and uncovering juicy details that reveal fraud and misrepresented financial statements, helping litigators win their cases and taking out the bad guys at the same time. Sound thrilling to you? If so, you may want to consider becoming a forensic certified public accountant (CPA). Ok, we must admit that maybe we exaggerated the “taking out the bad guys” part and watched a little too much of The Accountant. While a forensic CPA isn’t usually a fighting machine, such as Ben Affleck’s character in The Accountant who has a secret life in the criminal world, forensic accounting can be a thrilling career for someone who is naturally curious and enjoys the process of investigation. Catch the phrase, “skills possessed by CPAs”? To be a forensic CPA, you must first obtain a CPA license. What does obtaining CPA licensure involve? Education, examination and experience. Start planning for your forensic CPA career, now, by understanding what it takes to achieve the CPA credential as well was what it takes to be involved in forensic accounting. Think you are already on the right track to becoming a forensic CPA, or you are now interested in becoming one? Check out the infographic below to learn about the career’s benefits and see what it takes!